In the following passage Jerome Zanchi, the Italian Reformer and friend of Peter Martyr and Zacharius Ursinus, appeals to the authority of Thomas Aquinas to demonstrate the orthodoxy of his own definition of original sin (something Peter Martyr also did). This definition assumes the correctness of the concept of original righteousness and the inherited guilt that accompanies the loss of that ontological status. Although Zanchi refers to Thomas as Scholasticus he places the current paragraph under the heading Confirmatio sententiae ex Patribus (confirmation from the opinions of the Fathers). Many of those who consider themselves theologians in the Reformed tradition believe the Reformed position on Adam’s original state is antithetical to that of the Scholastics, positing a legal/ontological dichotomy between the language of “guilt” and that of “nature.” Here Zanchi shows no such dichotomy. Many of John Calvin’s references to Aristotelean cosmology occur during his later years, representing his mature theology. Christopher Kaiser has shown that Calvin viewed the universe through the lens of Aristotelean natural philosophy. (Kaiser, “Calvin and Natural Philosophy,” in Calviniana, vol. X) He accepted such ideas as the concept of natural place (the earth is the center of the spheres due to its weight), the system of homocentric spheres (the ten spheres interconnected and moved by the primum mobile), and the subordination of terrestrial cycles to the revolutions of the heavenly spheres. Kaiser notes that Calvin, as Aquinas and Bonaventure before him, sought to remedy the problem of the distant primum mobile with the providential guidance of the Christian God. Calvin did this by extending the sovereign guidance of the divine hand beyond the sphere of the Moon, where Aristotle placed a limit. Rather than solving the problem of how the earth remains stable while the enormous celestial spheres drag and press upon it by using a solution from Aristotle himself, Calvin substituted the providence of God who holds the earth upon the outer waters and keeps it stable as the celestial spheres move. According to Kaiser, “For Calvin, of course, there was a clear correlation between the concept of stability and order in the natural sphere and the sense of God’s protection in the personal and social spheres.” (ibid., p. 89) Therefore, the idea of God holding the earth in place brings much hope to believers that while the social sphere may be torn apart by tyrants God remains holding everything in place. It is interesting to think that Calvin’s theology may have become more Aristotelean during the final years of his life due to the influence of his Italian acquaintances, who were known both for their humanism and scholasticism. This passage is taken from Zanchi’s commentary on Aristotle’s De Principiis, on which he lectured while at the Strasbourg Gymnasium in 1553. Zanchi delivered his lectures at the same time as Vermigli’s lectures upon Aristotle’s Nicomachean Ethics. With it’s non-violent transition from Roman dominance to the doctrines of the Protestant Reformers, and with a history of powerful Reformers like Bucer, Sturm, and Vermigli gracing her walls, it is no wonder that an ex-Roman Catholic, Italian refugee like Girolamo Zanchi would have such high praises for the city of Argentoratum, which we moderns call Strasbourg. The following is a brief biography of Jerome Zanchi by Samuel Clarke, a late 17th century English Presbyterian. The accuracy of the data should be taken with caution due to the nature of the writing and the polemical agenda of the writer. However, the facts seem to be correct and do not present anything that appears blatantly dubious. 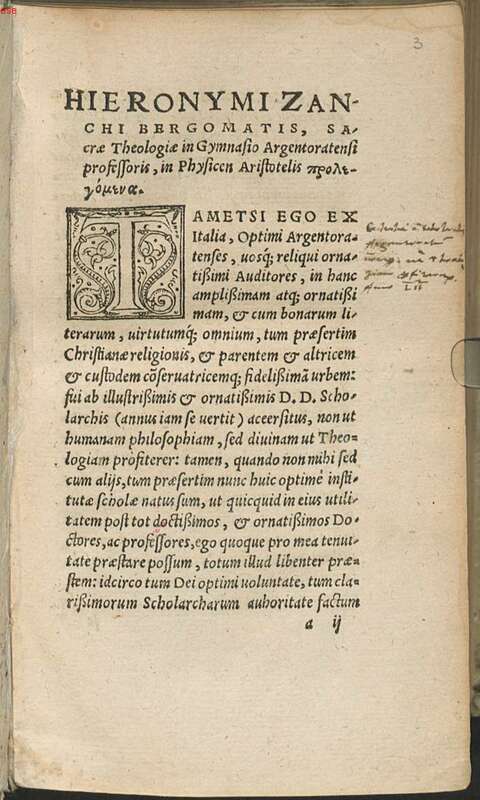 If I were to write this bio I would make greater mention of Zanchi’s humanism, particularly his lectures on Aristotle’s Physics that he delivered in Strasbourg while Peter Martyr was lecturing on the Nicomachean Ethics in the same school. I’d also include the fact that Zanchi, like Martyr, was a trained Thomist and even planned to organize his works into a Summa theologiae. Yet, the following is a good intro to the life and times of such a monumental Reformed divine who has been unjustly neglected in our day. The Bayerische StaatsBiblioteche is an excellent source of digitized books from all periods. They are up to 39,137 titles and adding more facsimile editions daily. The great thing about this site is you can download entire books in pdf. I’ve provided links to a couple of works that the Reformed community could greatly profit from. Martyr’s commentary has an English edition but Zanchi’s work needs to be translated for the benefit of those who are not proficient in Latin – it would provide a great source of scholastic learning for the laity and scholar alike. Anyone interested in the Reformed acceptance of the classics and Greek philosophy and Scholasticism should check out the following books.